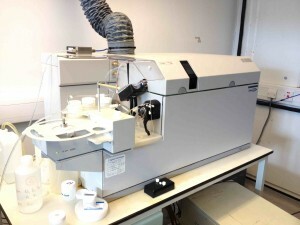 The Inductively Coupled Plasma Mass Spectrometer (ICP-MS) laboratory is equipped with an Agilent 7500s ICPMS for the determination of trace elements at the ppb and sub-ppb concentration levels. It has facilities for both solution analysis and laser ablation of solid samples using a New Wave 213 laser system. In solution mode, the instrument is routinely capable of determining the concentrations of a wide range of minor and trace elements down to ppt concentrations (equivalent to ppb concentrations in solid rock samples) with a precision of better than 3%. However, precision and detection limits can be improved significantly for specific elements using isotope dilution, alternative sample introduction systems and by varying the plasma conditions as in shield torch and cool plasma modes. Detection limits for laser ablation are ~10 ppb for most lithophile trace elements using a beam diameter of 60µm, although ablation under He can reduce detection limits further, by up to an order of magnitude.